Miguel Cotto, a man of few words and larger-than-life deeds in the ring, retired from boxing this weekend. 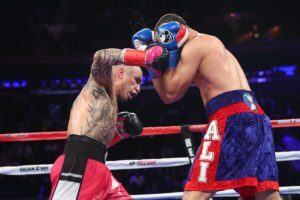 At age 37, Cotto dropped a unanimous decision to Saddam Ali in a tough and hard-hitting bout, bowing out on arguably the sport’s greatest stage, Madison Square Garden in New York City. Gracious in defeat, Cotto thanked his fans and summarized his boxing career with characteristic brevity: “thank you [to] all the fans. I am proud to call MSG my second home. I had the opportunity to provide the best for my family because of the sport.” In an age of unrelenting celebrity narcissism, Miguel Cotto spent 17 years in the hurt business for his family; the boxing glory was incidental. Turning pro in 2001, Miguel captured his first world title in 2004, the WBO World super lightweight belt. He then reeled off six successful defenses, the last against Paulie Malignaggi in 2006, a twelve-round unanimous win. Cotto then went up to 147, winning the vacant WBA World welterweight belt against then-undefeated Carlos Quintana in Atlantic City, in December of 2006. After four successful defenses — including back-to-back wins over Zab Judah and Shane Mosley — Cotto relinquished the WBA belt in July 2008, suffering his first loss against Antonio Margarito (TKO 11th) in a bloody and controversial bout. But in February of 2009, Cotto bounced back, winning the WBO welterweight belt from Michael Jennings (at MSG). In his third defense, Cotto took on the great Manny Pacquiao, then at the height of his talent. Pacquiao won by TKO in the 12th at the MGM Grand in Las Vegas in an incredible, action-filled thriller. Cotto then went up to super welterweight, winning the WBA title by stopping Yuri Foreman in nine rounds at Yankee Stadium in June 2010. After a successful defense against Ricardo Mayorga, Cotto faced Margarito for a second time, battering the Mexican fighter into a ninth-round retirement. After Margarito had been exposed with doctored hand-wraps against Shane Mosley, Cotto’s revenge victory was all the sweeter, and called into question the outcome of the first fight. In May of 2012, Miguel faced undefeated Floyd Mayweather at the 154-pound limit, and lost a unanimous twelve round decision at the MGM Grand in Las Vegas, in one of Mayweather’s most coldly efficient exhibitions of defense and counter punching. After a consecutive loss to Austin Trout, Cotto sought new challenges in the middleweight division, defeating Sergio Martinez for the WBC title in June of 2014. This set up a great crossroads battle with rising Mexican superstar Saul Canelo Alvarez, in Las Vegas in November of 2015. Alvarez took the twelve-round decision and the belt. This time, it would be a nineteen-month layoff before Cotto returned to the ring, as he faced Yoshihiro Kamegai for the vacant WBO super welterweight belt in August of 2017. Kamegai put in a game effort, but Cotto gave his fans one of his finest performances to date. Not content, however, to retire on that note, Cotto decided to finish his career with one more fight, this time at MSG against a top opponent. That Cotto choose a tough, competitive fight for his last bout, when by all rights he could have taken a victory lap, speaks volumes about who he is as an athlete and a person. As a fighter, he could duck and slip like a bantamweight, his right hand was held high to protect his chin, and he came forward like a dancing bulldog. With his left hook as his best punch, he could throw it as a lead, or from inside. Cotto fought hard, always gave the fans his best, and he took on all the big names of the sport. He summed up his approach to boxing in one of the final press conferences: “I have always dedicated myself fully and worked hard; now [I am] finishing my career on my own terms.” A four weight-class champion, Miguel Cotto leaves behind a legacy of great achievement as a boxer and genuine integrity as a person.